Since opening to foreign investment in 1979, China has emerged as the leading investment site for multinational corporations. Remade in China looks beyond the macroeconomic effects of China's investment boom to analyze how foreign investors from the US, Japan, and other nations are shaping China's legal, labor, and business reforms. Wilson draws on interviews with nearly 100 foreign and local managers, attorneys, workers, and members of the business community to explain why Chinese laborers and firms have gravitated toward foreign models, especially US businesses and their institutions.Wilson uses the term "state-guided globalization" to describe how China has used foreign engagement to advance its domestic reform objectives and to enhance its role in international society. Rather than undermining state power, globalization actually has allowed China's state to push through difficult labor and legal reforms. Wilson concludes that Chinese policy makers drew lessons from foreign investors and foreign legal experts on how to introduce difficult labor market reforms in its state-owned enterprises and how to promote rule of law.Remade in China examines globalization and foreign investment in a different light, showing how these developments have helped to chart China's entry into international society. China's WTO accession agreement and international norms have established parameters by which to judge Chinese legal and business reforms. Although China's rise is a grave concern to the world, Remade in China asserts that Chinese leaders now see compliance with international rules as a means to secure more investment and to enhance their international legitimacy. 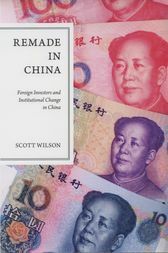 Wilson provides a lucid and insightful analysis of how foreign and domestic actors, from political leaders to average laborers, have contributed to remaking China's institutions. Scott Wilson is Professor and Chair of Political Science at The University of the South. Beginning in 1985, he has lived in China for five years, researching Chinese political economy. Currently, he is focusing on NGOs such as legal aid centers, AIDS groups, and environmental protection organizations, which promote legal development in China.